Pre-Order the Traveler's Guide to the Gun Laws of the 50 States! The Traveler's Guide will be available the 2nd week of January 2019. You can pre-order your book now. The book that had to be written! 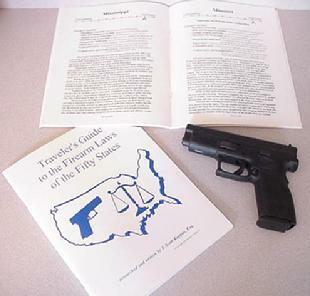 Because you are subject to arrest for simply traveling from state to state with a personal firearm, some sort of guide has been badly needed for years. This excellent book covers all the basics for armed travel: vehicles, the glove box, open carry, loaded or not, weapon types, more. Features the complete national reciprocity list, plus a list of every state's Attorney General's office! Ideal choice for all concealed-carry permit holders. Kentucky attorney Kappas has created an indispensable tool, while work is underway to restore our eroded rights. In the future, maybe, if you have a gun and you're not a criminal, that won't violate anything. Until then, get and read The Traveler's Guide to the Firearm Laws of the 50 States! Includes Canada & Mexico too. Read it before a trip, pack it, or leave one in your vehicle, so you know what to expect as you approach each state line. Clear writing gives you the basics for every state in one handy guide. Plus, each state is rated for its relative freedom, based on its gun laws, from zero to 100. See where your state ranks. A leader in the Minnesota Permit to Carry and Renewal/Concealed Carry, Iowa Permit to Carry/Concealed Carry, Florida Permit to Carry/Concealed Carry, Wisconsin Permit to Carry /Concealed Carry and Arizona Permit to Carry/Concealed Carry Training! Training Locations: Fargo and Grand Forks, North Dakota. Monticello, Nowthen, Owatonna, Rochester, Rogers, Roseau, St. Cloud and Wadena, Minnesota. Minneapolis & St. Paul (Twin Cities), MN area. Meeting all of your training needs.